I'm planning a bike trip this year and plan on bringing the Q along. I'll probably bring a 12v battery pack. Is there any way to charge the Q batteries with 12v power? It's not possible to directly charge a 12V battery from 12V power since they have the same electrical "pressure" and won't push charging current into the battery being charged. I'm not familiar with the Q but I assume you're referring to charging a 12V Q pack from vehicular 12V power. One good solution is to take your regular charger, and purchase a 12V inverter which converts 12V from your 12V source to 110VAC and then plug in your Q charger. These inverters are small and for that purpose (low power) can be had for as little as $10US (Monoprice - AUKEY 150W), plus you have 110VAC for other low power needs should they arise. Some inverters also feature a 5V USB output which comes in handy. The only other solution is to purchase a special charger which runs off 12V and charges the Q pack (don't know of any source, but they may exist). They basically boost the 12V internally and then regulate the higher voltage to provide 12V charging. Last edited by Bob 256; 02-23-2019 at 09:03 AM. Is there a reason for 12V? These days, most bicycle accessories (lights & GPS/computers) come with USB charging and USB power banks are easy to get. If you are feeling hackerish, you could cannibalize a USB bicycle light for its built-in USB-to-LiIon battery charging circuit to charge a Q battery. 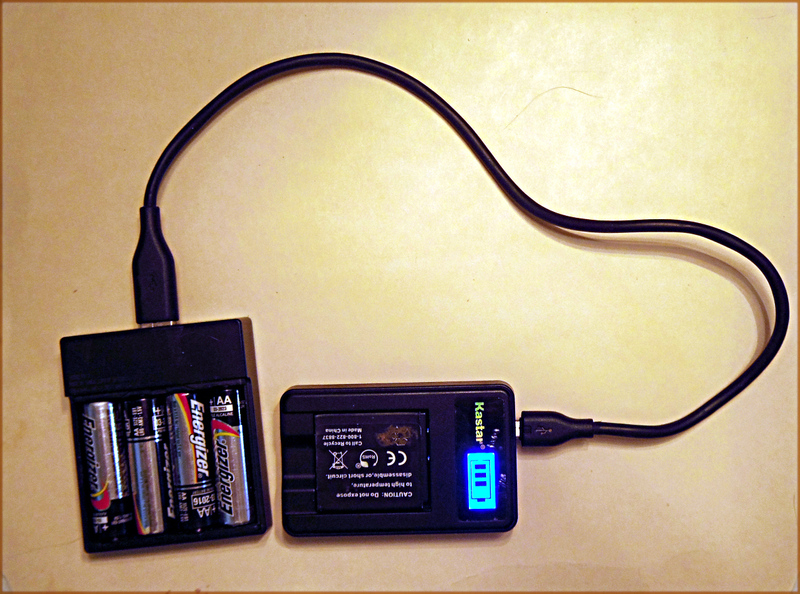 The other solution is just to bring a few spare Q batteries (which may actually be lighter than any charging kit). Last edited by jlstrawman; 02-23-2019 at 09:31 AM. This may do the trick. Thanks! Unless you are really off the beaten track, there will be any number of 110 VAC sockets around (motel, gas station, restaurant, library, ...). The regular Q charger plus the AC cord is pretty compact already! If desired, you could significantly shorten the cord - cut out most of the wire and splice the end plugs together. I think you already found one answer above. Here's another. Wasabi chargers include a 12V car plug as well as the normal 110V. I'll be on a bicycle and camping so I'm trying to lighten my load and charge from a solar panel while I ride. The Fuji NP-50 battery is compatible with the Q and seems to have more options for it. A USB powered charger with bonus feature LCD display indicating to you the progression of how much the battery is charged is nice. Happy travels! Can you drop us a review after you come back regards how well it works for you. Yes, I usually travel with my Fuji W3 (3D camera), Instax SQ10 (instant camera and printer) as well as a couple of Pentax Q bodies and assorted lenses. I find this kit very convenient because all three cameras use the same lithium-ion batteries and I only need to bring one charger (mine connnects to a standard USB plug and has a double charging slot). Last edited by Abbazz; 02-24-2019 at 07:49 PM. I have that Kastar charger - it permanently lives in my Q-7 bag and does a great job. My "emergency" source of charging is a Ray-O-Vac device that creates a USB power source from 4 AA batteries, because I can get them everywhere. Any idea about how long does it takes to fill a flat battery? No. I don't allow mine to get that 'flat'. This is an "emergency only" system for me. I've tested it take make sure it works, but I've never taken a battery all the way from low to full. My sense is that it is noticeably slower than the Pentax charger, but I would use it only if 110 volt is unavailable.